Reprinted with permission from Denis Tegg’s Teggtalk. The latest all-important Ministry for the Environment Guidelines for Local Authorities on Climate Change have been prepared in strict secrecy. They are held under a tight embargo until the Minister gives his approval for their official release. 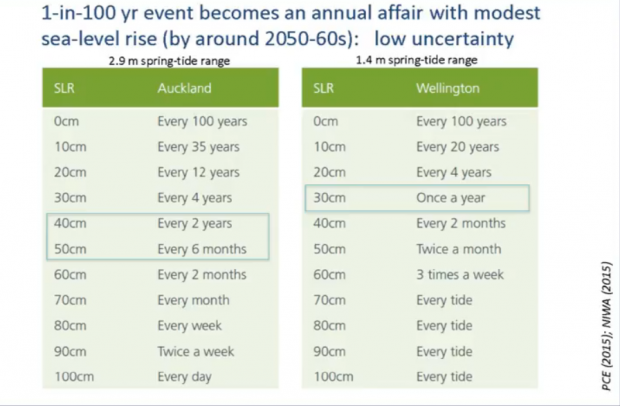 But key elements of the guidelines, including the latest Ministry projections for sea-level rise have mistakenly been made public in a PowerPoint presentation by the Ministry recently given to the Waikato Natural Hazards Forum. The Forum published the slides on the Forum’s public website, from where I was able to download a copy of the presentation. The Minister Nick Smith will likely be thoroughly pissed off about this breach of information security – the projections were meant to be hush hush until he made his grand announcement. The presentation not only includes crucial details of the Government’s projections of sea-level rise but also describes levels of sea level rise which should be applied by local authorities to various types of development. 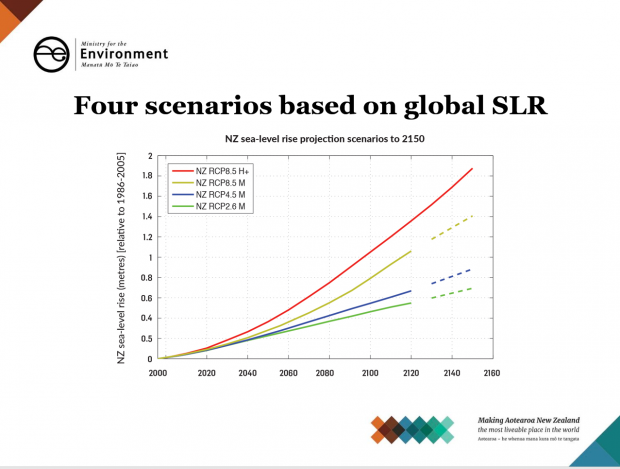 Slide 11 contains 4 scenarios based on the Ministry’s projections out to 2120 for New Zealand sea-level rise. These coincide with 3 IPPC climate change based scenarios plus an additional H+ scenario said to be at the upper end of projections. Slide 12 sets out single sea-level rise values derived from the scenarios relating to 3 broad categories of development which are assigned 3 different sea-level rise allowances. 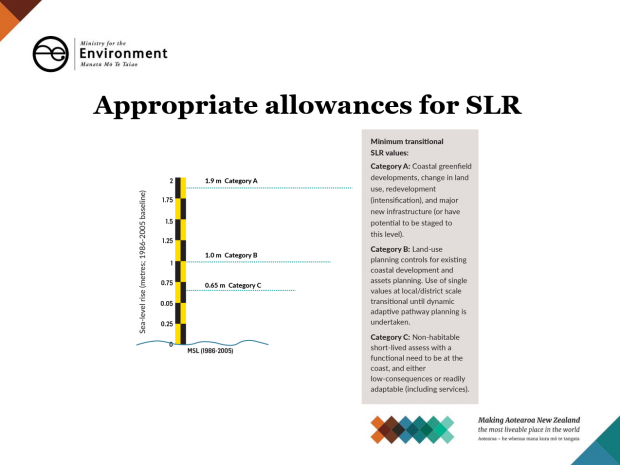 These “minimum transitional sea-level values” are provided to assist councils in the short term. Category A – Slide 12 describes how major new development or intensification of existing developments needs to consider a high-level sea-level rise value of 1.9 m. This 1.9 m value would also apply to new infrastructure such as roads or infrasructure having the potential to be staged. 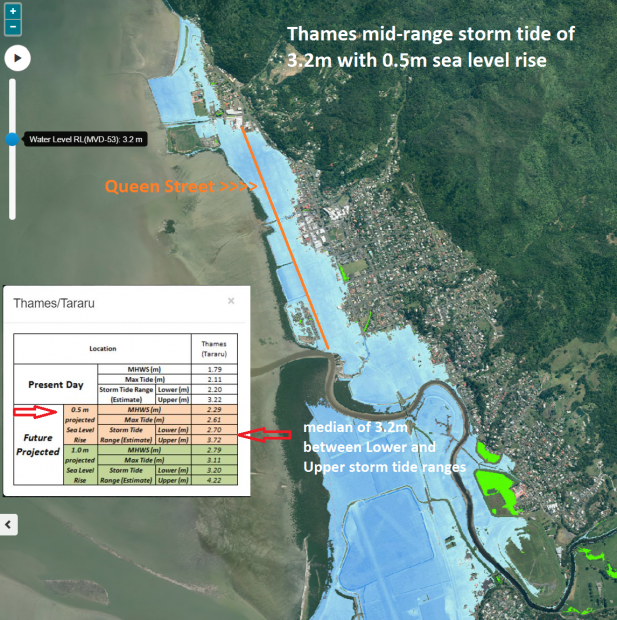 What could my town of Thames look like in 2050 – just 33 years away – with 0.44m of sea level rise and a normal maximum tide? 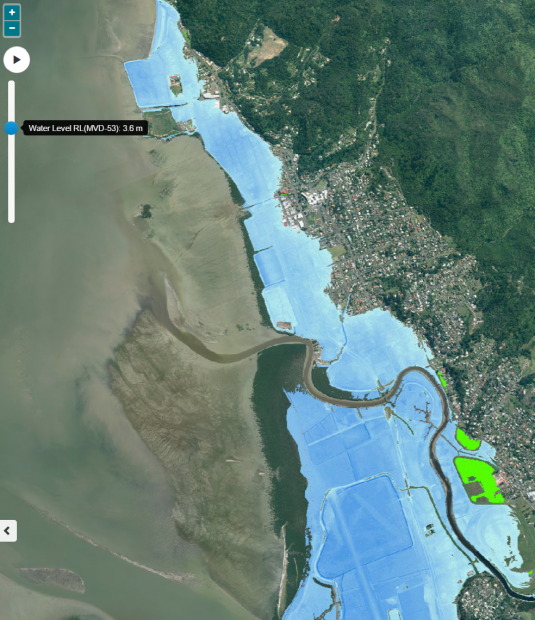 (Blue areas are connected to sea and green areas disconnected from sea – Map generated by Waikato Regional Council Coastal Inundation Tool) Like this ……. The Parliamentary Commissioner has warned that current 1-in-100 (1% AEP) severe damaging storm tide events will occur every year with 0.5 m of sea level rise. Are there any plans to extend Waikato’s coastal inundation tool to the whole country? I can’t see anything on the website that would indicate it. Possibly something other regional councils would pay Waikato to do, now they’ve done the hard yards? 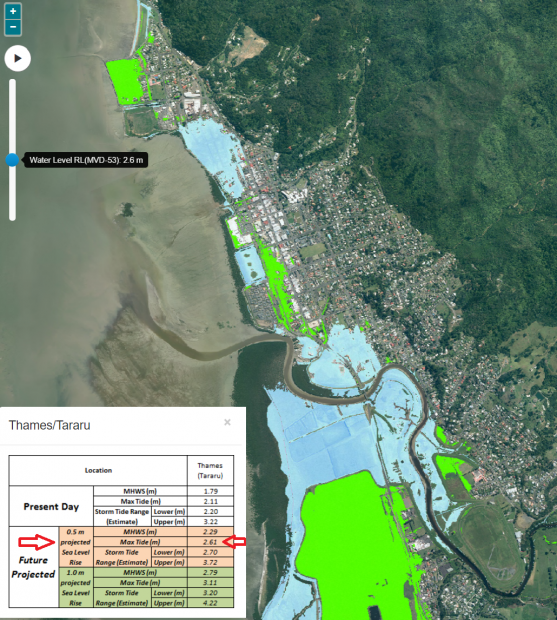 If the other councils have coastal inundation sites like Waikato’s then the consequences can be shown graphically. Whitianga will also not be the same. National Geographic has a searchable global version. Jeff Foley has produced some very useful material on Anthropogenic Global Warming as part of the presentation he did for the Fabians in November last year. For the effect of sea level rises, his part 3 (link below) will show other areas of NZ with sea level rises. Thames is a particularly badly affected ( the other is South Dunedin) because they lay at the end of an ‘open gulf’ and effects of a seiche . That should be a sobering post for any policy maker or politician out there. Should be. What about the horizontal incursion of salt from sea level rise? What effects on soil and for how far inland? What about airports located at or near sea level and docks? Are there wharfs that are going to become stranded at sea? Is the idea to keep adding landfill to airports that sit at or near sea level? For how long? …last week I was reading in the ODT that the council’s roading upgrade around the harbour was going ahead in spite of being way over budget. A road is meant to be built on the premise of it being around for a long time. In Dunedin’s case we’re looking at some 50km of road that’s possibly slated to be under water 10 or 20 years after completion. Apparently (and I kid you not) the reason the project is going ahead is because of sea level rise! No, the road isn’t being elevated and sits more or less on the water at many points at high tide. Or consider the Waiwhetu Aquifer in the Hutt Valley from which Wellington gets about 50% of it’s water supply; totally unusable if sea level rises enough to flow back into it. In many ways it’s not the obvious issue of property inundation that’s going to be the first concern here. It’s going to be the vulnerability of all the services and roading assets that will be the problem. It’s no use sitting smugly high up on a hill if you cannot flush the toilet because the town sewers and treatment plant aren’t working. Or the property is worthless because the insurance companies won’t touch it, and you can’t sell it because no-one will mortgage it. Insurers and utility asset managers, ahoy there! Would be great to hear views from a reinsurer familiar with Christchurch. I think there’s a ‘danger’ in people simply looking at ‘their’ suburb or whatever and failing to take into account all those underlying and often essential pieces of infrastructure that may lie at some distance from their location. What’s this about – ‘people looking at ‘their’ suburb’? I don’t get the feeling anywhere I go that people are thinking at all about being in danger in the future. If they have enough money and feel high enough above coastlines which they might be concerned about, they think they will tough it out, and all will be well or at least not too bad. If they have good jobs and are working hard and succeeding there is a halo of confidence around their heads. The world will creak on if there is another slump and we’re smart people, we can manage goes the internal dialogue. heh – there is that. And I’d agree or suggest that far too many people have that dumb-arse attitude in spades. As you might guess I was professionally involved in this for some years and while you are quite right, the issue with Waiwhetu is that the balance between fresh water extraction and salt water extraction is fairly closely balanced already. A series of bores right on the Petone foreshore are used to constantly monitor for salinity intrusion. Any substantial increase in sea level would almost certainly reduce the amount of fresh water available for extraction. The challenge is that despite a fair bit of modelling and research, no-one is sure by exactly how much. Thank you for drawing more attention to this looming danger. Well done Denis. Shows the power of high quality blogging. David also highlights the lack of resourcing of Local Authorities. Central Government has foisted all the responsibility and cost of planning for climate change and sea-level rise onto local councils, many of whom are either still in denial or struggling with such a daunting task. Thames-Coromandel Mayor Goudie makes a reasonable point that the government needs to front up with much more resources if they expect local councils to do this work. Goudie gets into avoidance mode however by concentrating on the relocation of whole towns which is still some decades away. In the meantime, her Council and the Regional Council have it well within their budgets and capability to identify the hazards including coastal flooding, and include maps in the District and Regional Plans. Identification of hazards is the first step and Thames Coromandel and many other councils need to just pull finger and get on with that job. ‘Where’s the money for relocation?’ asks Goudie. Fair question. Which specific budgets are going to be the most affected in the long term? Definitely civil defence, constantly having to evacuate people on a regular basis. The replacement, repair and maintenance of inundated infrastructure will hit Tranzit NZ and ratepayers. I’m sure you can think of a few more. It all adds up, and that being so, relocation is possibly one of the cheaper options. Denis is it time to simply delete all regional councils, and instead power up MfE? I’m rather fond of the Regional Councils, apart from some where the Boards got captured by farmer interests I think they’ve served rather well. In my opinion their staff professionalism was usually top notch and because they were usually removed from the always murky world of zoning and property consents they were much less prone to the kind of sly corruption that taints other sectors of local govt. I can see the case for a single Environment agency, but I don’t see enough compelling reasons to make the change. Or if you were going down that path then you would essentially have DoC responsible for all state owned land and MfE for all the rest. A lot of their functions would link and overlap … so the next question would be … get rid of DoC and have a single almighty Ministry for Everything Environment. Not sure that logic appeals either. Especially with Maggie at the helm. I’ve found regional councils good to deal with from the public side too. Am intrigued by the idea that there are some that aren’t captured by farmers. Another problem with the MfE idea is it is centralised. 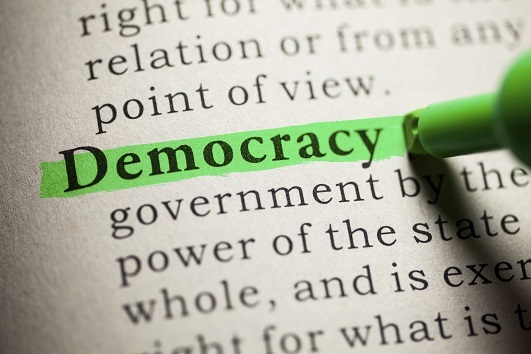 I want local authorities because they’re more connected to what is going on. Poor thinking Ad. Regional councils discussed below have been found to be another avenue for moving the areas along the way they should. All one has to do is get rid of some of the pragmatists, and bring some forward-thinking practicalists in. Something we could all start on. Researching the collection of water into a tank and having it suitable for drinking. May be trying to keep it clean from the start, the right paint on the roof etc. And then in an emergency have tablets that will kill off any nasties that have got established in there. What else for a start by the indiviual? Should be mandatory on all new housing along with solar panels. Water tanks and composting toilets in cities? Is this a possibility? Composting toilet. Do they have to be on a slope and dug up eventually at the bottom to put on the garden? Can they be in the house or is it better to walk to them away a bit? Do they smell if everything isn’t done right? Do you have to have a supply of material to throw on them? handle all sorts of things without breaking down? What if stuff was put into them, water with disinfectant in it, sour fresh meat, sour milk – would that sort of thing upset the workings? Are they allowed by all local bodies? Has the local body association got a system whereby they will research something and then release it for all councils to adopt if they want? Just some questions you might know something about for people who don’t. 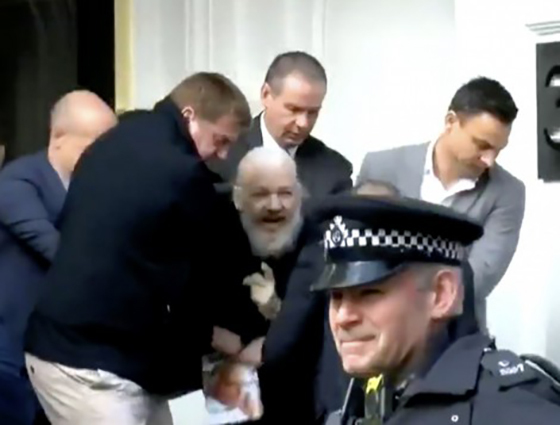 I think the analogy of the fall of Rome to the barbarians is apt for what is going to happen to a lot of cities and towns around New Zealand and the world. The city of Rome didn’t collapse with the first invasion around 405AD. The Romans picked up the pieces and kept on going, but with every succeeding sacking over the next century or more it slowly decade till it was not much more than a large town full of ruins. Places like New York and London (and much sooner Miami) plus parts of Wellington, Dunedin etc won’t succumb to one big flood. It will be like what happened in New York a couple of years ago. There will be regular floods that increase in number over time. Eventually socieities will get the message that it is pointless in trying to rebuild again and leave these to their fate, building higher inland. Of course the other thing is that long before coastal areas go under water, insurance companies will stop insuring vulnerable properties which will become valueless except as temporary squats long before they perish. This second scenario will start to play out in parts of New Zealand within about 20 years.